Will Thor: The Dark World Showcase All Nine Realms? Marvel Studios has been very clear about their plans to expand the interstellar scale of the Marvel Universe in the now-in-production Thor: The Dark World. Today, though, a new report from Russian site Kinopoisk suggests that the film may do so in a major way, pulling in the full Nine Realms of Norse mythology and Marvel comic book lore. 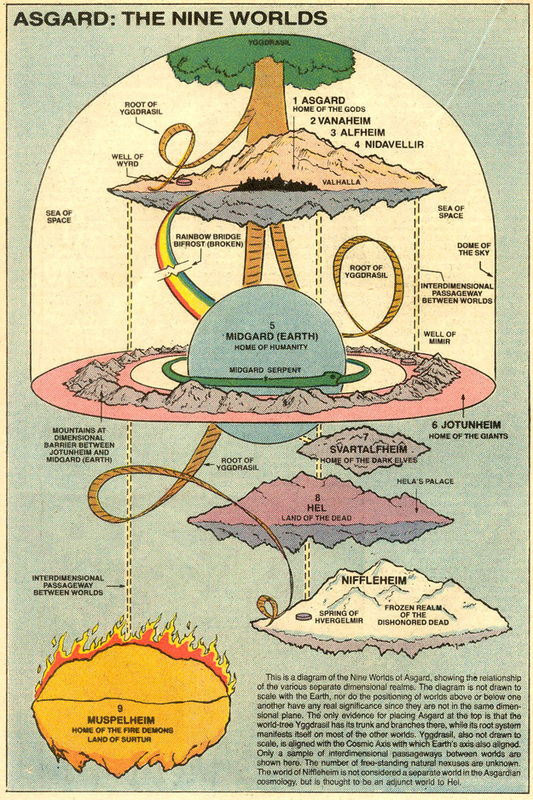 The original films showed off Asgard, the home of Thor’s people, Midgard, the Earth, and Jotunheim, the home of the frost giants. Reports of Dark Elves appearing in the sequel pretty much guarantee that we’ll be seeing their world, Svartalheim but that still leaves the Light Elves’ realm, Alfeim, the Realm of the dead who are neither honored or dishonered, Hel, the Demon world of Muspelheim, the Dwarven real, Nidavellir and Asgard’s sister-realm, Vanaheim.